Stunning Homes With Pools Just In Time for the Dog Days of Summer! What better way to kick-off July than with a Castle Pines Village home built to entertain! 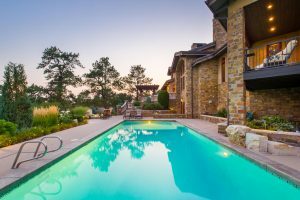 We zeroed-in on the best homes with pools in Castle Pines Village that are perfect for hosting family and friends at your next summer soirée. Whether it’s expansive terraces and mountain views you’re after, or sparkling pools that offer a secluded escape, we have the home for you. If you’re searching for a comfortable showplace the whole family will enjoy, look no further than 617 Cliffgate Lane. Nestled on 1.62 secluded acres, with 5-bedrooms, 8-bathrooms, and a sprawling 8642-square-feet, this home has it all – including a stunning resort style pool and spa coupled by expansive terraces, water features, a private pergola, and an outdoor kitchen with bar. The best part? It backs to open space with unobstructed Rocky Mountain Views! Once you pick your jaw up off the floor, you’ll learn it’s the ideal spot for grilling out with family and friends, and serving bomb pops to the kids. We can almost hear the splashing in the pool, the steaks sizzling on the grill, the pop of a wine cork from the bottle you just grabbed from your very own wine cellar. Make it a family tradition, and start celebrating our nation’s independence in style! 617 Cliffgate Lane Castle Rock, CO is currently listed by Wanda Ford of LIV Sotheby’s International Realty for $3,790,000. Ideally positioned on a stunning 1.8-acre lot, this 5-bedroom, 6-bathroom, 6,897-square-foot rustic contemporary is ideal for entertaining with a price that can’t be beat! For starters, it affords buyers with all the amenities of a five-star resort, including an open airy floor plan marked by walls of windows and picture-perfect golf and mountain views! It comes complete with a main floor master suite, sophisticated gourmet kitchen, heated driveway, and spacious home gym. But the real prize? The exquisite outdoor living area with the pool and patio of your dreams. We can’t help but fall for its luxurious crystal blue pool, multiple outdoor terraces, built-in grill, and number of secluded spots to gaze at the sky. From elegant indoor-outdoor entertaining, to celebrating all summer festivities, what better home to host family and friends than 95 Crown Point Place? Call now for a tour. 95 Crown Point Place Castle Rock, CO is currently listed by Wanda Ford of LIV Sotheby’s International Realty for $1,879,000. Curious about other great homes with pools in the area? I have some top picks from around the neighborhood and would be happy to show you around!